You have to admit the 51 year old Thierry Michaud is still looking good these days. The long warm summer days in the South of France have given him a light brown glow that I can be sure he didn't catch at Penrith last year, when this photo was taken. Thierry was over on business of course, but really, I guess its business mixed with pleasure. Following a very successful career as a professional trials rider during the 80's and early 90's, which secured him 3 World Championships, Thierry is still very much involved in trials. 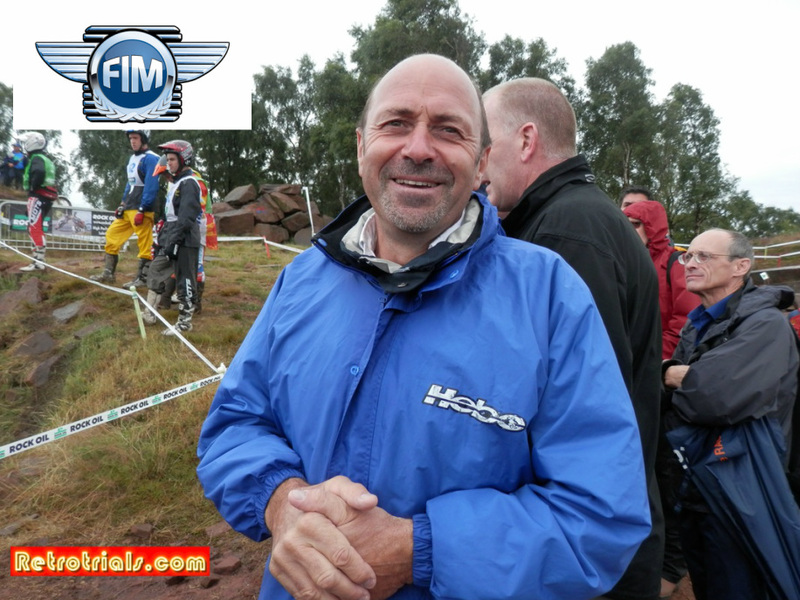 Mr Thierry Michaud is the Director of Trials at the Federation of International Motorcycling. In essence you are looking at the man with the biggest and most influential job in Trial. He is "Mr Trials". Of course, this is not what we remember Thierry for. For me, like so many others of you, Mr Michaud was an incredible trials rider back in those rose tinted days of the 1980's. 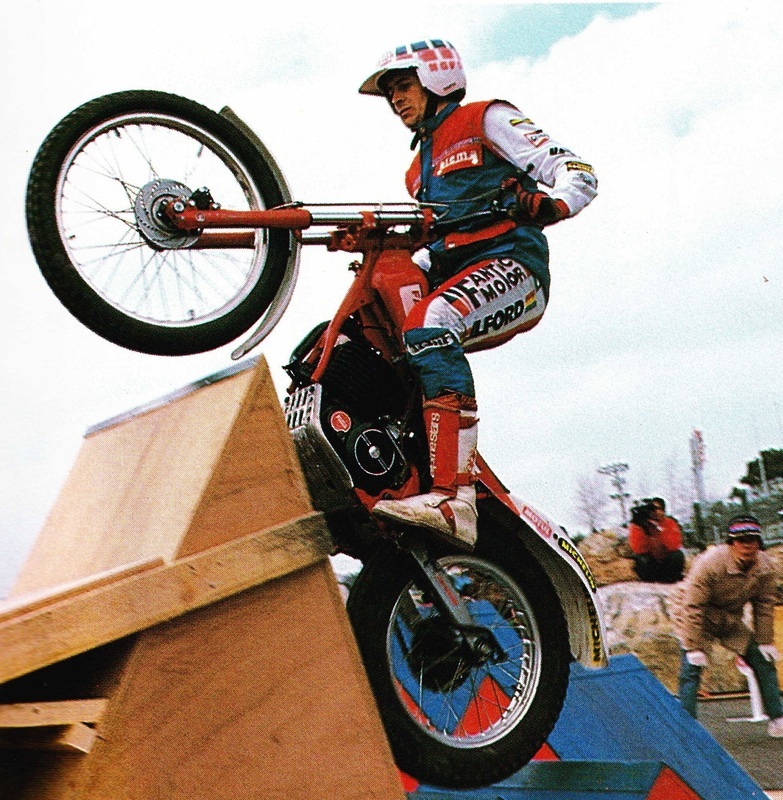 His leg waving traditional riding style mixed with an uncompromising gritted determination and exotic Factory prototypes won him the admiration of trials fans around the World. 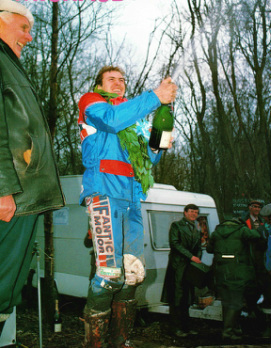 As well as winning him admiration, Thierry won 3 Trials World titles in 1985, 1986 and 1988. He also won 9 French Championships, 3 Scottish Six Day Trial events and was a member of 4 successful Trial des Nations French teams. 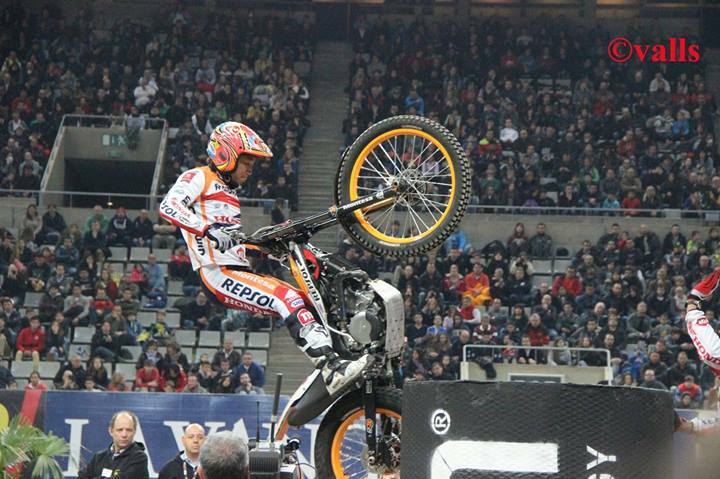 Thierry Michaud was an incredible rider. A rock that for so many others riders was impassable. So, you can imagine seeing Thierry Michaud standing on the edge of the section, at the World Trial was an opportunity that I could not let pass me by. It was as if a flag had dropped. I almost ran over to him and like a little boy said 'Hello Thierry, it's great to see you here'. He turned around and looked at me. I felt as though I had shrunk to the size of 2 inches as if being judged by God at the gates of heaven. He then replied but I didn't hear anything....I was numb ha ha. A moment later when I was conscious again, I found myself swaying with only the section tape holding me up. The white cloud in front of my eyes had disappeared I introduced myself. Thierry was a very friendly guy and was only too happy that I wanted to tell his story on my web and also that there was interest in this old days of trial. I did warn Thierry about Retrotrials. I did explain to him that the readers here want detail and want the inside story. We want the questions answered and the myths put to bed or confirmed. I did explain that he had 30 years of questions that needed answering and that it would take time. I told him that we needed to satisfy the trials experts and lifetime riders and that most of the readers here knew their 303 from their FM 350. Thierry took the challenge and he gave me his email and telephone number there and then. We said good bye for now. About 5 minutes later I sent him an email (I'm joking). It was a few weeks later in fact ha ha. Thierry had already told me that only his personal friends visited his home and as I wasn't one of those he would have to shout his answers over the garden wall. I suggested that the neighbour's might complain so we agreed on a telephone call. An email later and we agreed on the date and time of this call.......so I got busy. With the help of Fantic and Michaud fans across the country we prepared the question list to end all questions lists. 11 whole pages. It would only be by doing this properly that I would feel truly satisfied that it had been done well, and lets face it .....I would not get a second chance. The interview is huge, monumental, incredible, detailed and in chronological order. Because it was so detailed the interview was carried out on two separate occasions, because there are only so many hours in the day and because British Telecom cut off international calls after 1hr 56 minutes precisely. 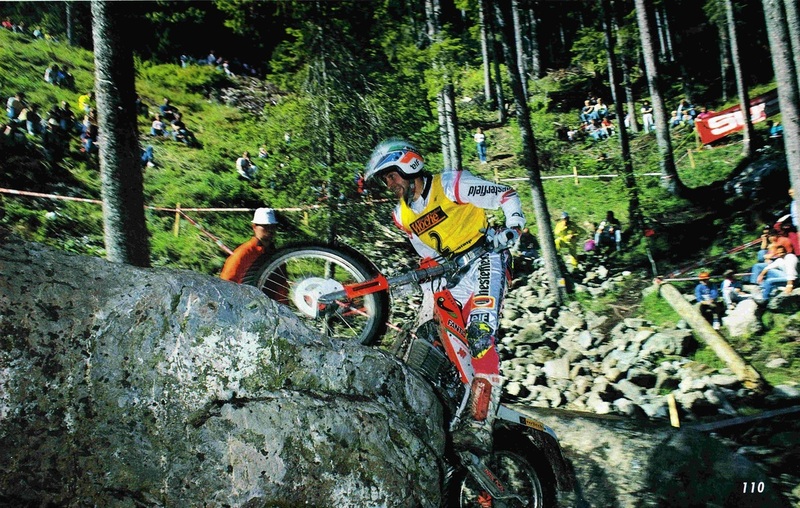 This report here, that you are reading now is not about Thierry's incredible career as a trials rider. That will come later. This is an interview with Thierry about the changes that are occurring in trials right now. Its an opportunity for the FIM trials director Thierry Michaud to speak to the trials riders direct with unlimited wordage and space. Its an opportunity for the FIM to explain their thinking, their goals, what they are doing and why. There is a lot of talk about the changes, but there is little information from the FIM. I think this interview change this. I hope you enjoy and find it interesting. More information is always good. This interview was recorded with of course Thierry's knowledge. What you are about to read is exactly what he said, word for word. Thierry's English is excellent but even still, you may have to take your time with it and read it slowly. Don't speed read it and expect to understand it all. If you do read it carefully you will get the full picture and I think, understand a lot more. So, as the Director of the FIM, what is your mission now? Mission, a lot of missions. The mission is, to try to have the trials sport in a better condition. I mean its not possible for the FIM to be involved in all the clubs in the world, so the FIM is the top institution. It’s power is not so big. What we are trying to do is trying to improve the skills of the associative clubs. 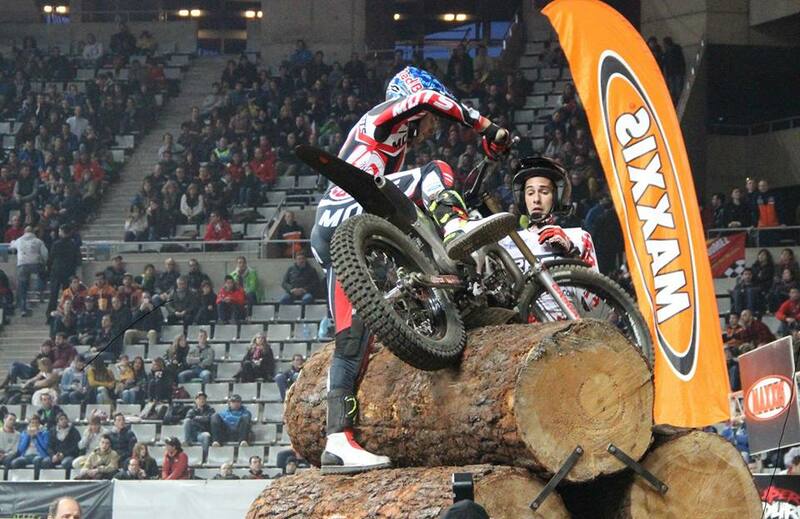 In fact the FIM is working more only with the rules of the World Championship. We have changed a rule last year and we have been really criticised by many persons. At the moment we realise that it is working quite good, we are quite happy at the moment. There is still big trouble and we have a lot of jobs to do, but we just try to work for the sport, not only for the competition. We realise that the competition was so athletic, so, the technique was so athletic and spectacular, and it was good for the show but not for the market. And for many reasons, for ecological reasons, for financial reasons, for many things trials is in big trouble, but we also think that trial is in trouble because the riding is really too hard. It’s too athletic, to hard, to much extreme. Then the trial grow in the spectacular part, but going down in the practical possibilities, in the accessibility. We just try to have more, to find again the trial sport more accessible, easier to ride if you prefer. So this is our main target. I try to with my experience as a coach and technical person because me I am not a political person, I am just a technical person. I think we have a lot to do with the FIM academy, we can really improve with documents and with the seminars and so improve the possibility for the training camp for the riders and overall the educators, make seminar for the marshals in the future, for the makers of the stations, really try to improve the skills of all the persons involved in the sport of trials in all the world and then it a very pretentious target, it’s very hard, we will need many many years, I’m sure, but we are really fighting very hard and working very hard. In fact FIM has to work with volunteers associative of the world and we are also working with professionals at the factory and it’s quite a very important strategic plan if you prefer. It’s really a plan for many years and there are many things to do. We have to make some choices because it’s not possible to do everything in one year. At the moment what I would like is to recreate conditions and persons belief in the institution because what we have this past year, is nobody believe in the competition, they just think the FIM is here to control with officials. They think FIM is officials to control in the World Championship that’s all, and this is was not the case, but I really want to give another way for the trial from the FIM and to give a services, you know, not arriving here to control, but propose that the FIM is here to work for the sport, not to control the rules, only that, but to work for the sport and the FIM has a lot of skills and power to help with the sport, to help the riders, to help the marshals, really to work for the sport. If you prefer I think the commission of the FIM ,it’s a trial sport commission, not World Championship rules commission. It’s about the whole sport not just the World Championship. The completion depends on the sport, if the sport is going down, if the market of the trial sport, as I say I try to finish on that image. 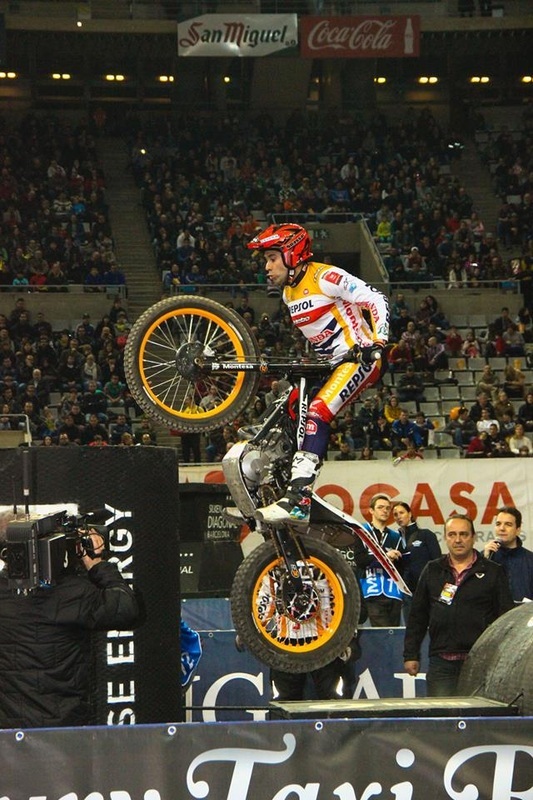 The World Championship is the main thing for the promotion of the sport, the World Championship natural trial, depends on the market, on the money, of the financial condition of the market, the selling’s of the bikes. If trials sport is a show it depends how many spectators go in the stadium, how many persons pay to look at the X trial, its totally different conditions. Of course there are many many things depending on that, this is the main thing, trials sport the competition of the World Championship depends on the market of the sport. Then we have to do something, every time we do something on the World Championship what would be the consequence to the sport. This is the main thing. After the World Championship, it is a World Championship but we really think about the fundamental things of the sport. This is the main thing. ﻿I am fairly close to the sport and I am asking you questions which many people would like to ask you and this is the opportunity. People say the weight has increased to 70kg for bikes this year because of a reason. Some people say this was because Honda have put pressure on you, is this true or not? No. When you say on you. All I would just like to replace the condition. As for the decision for the non-stop and for the weight. The new rules for the weight are taken by the FIM in collaboration with the manufacturers. For the non-stop and for the weight. For sure the position of the manufacturers was different on this subject, for sure. The wishes of the institution of the FIM and also the manufacturer or most of the manufacturers is to have a frame to know in which you can work. They want to have rules. They want to have technical dimensions, as we have for a tyre, as we have for the brakes, as we have for the capacity of the bike, as we have for the weight. Because in fact, the will, I don’t know if this is a good term. The will to don’t work very hard and spend a lot of money always reducing the weight. From 5 years ago the limit of the weight has been on the table. It is not something that happened last year or a few weeks ago it has been discussed for many years. The manufacturers, they want to do it .The majority of the manufactures with the FIM decide on this. James, I understand that some persons can decide that this is stupid and stop the evolution of the bike and things. The other thing we have like in many, not in all but in many sport, mechanical sport, you have to decide and limit some evolution to don’t create trouble in the future. Then the FIM and the manufactures decide 70kg will be a good compromise. 77kg, I think for the 125 and 70kg for the bigger bike. It will be a good compromise for the bike. It will be near the standard bike because the standard bike is quite near 70kg. It is not 65. It is 65 when the bike is prepared but there is very little difference with that. We will work on other evolution of the bike but we will stop the number of the money, time and effort to always want to have a bike still lighter. It has been a decision for that, for sure there have been some manufactures who are more in favour than others but in the end we have to find a compromise.